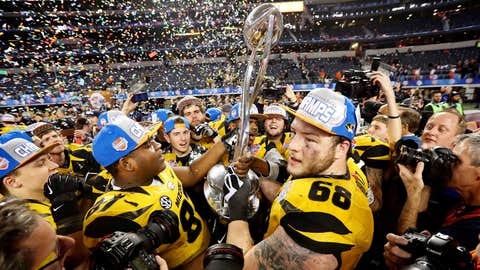 The Missouri Tigers celebrate winning the 2014 Cotton Bowl vs. the Oklahoma State Cowboys. Once in a while you just hit gold, and you know it immediately. Missouri beat Oklahoma State 41-31 in the Cotton Bowl in dramatic fashion Friday, riding junior RB Henry Josey’s trio of touchdowns to victory. Josey was named offensive player of the game, averaging more than 7 yards per carry on the way to a 92-yard total. But all the Tigers deserve credit for giving us one of the greatest postgame moments of the bowl season: Gary Pinkel gettin’ his groove on. Why was Pinkel so excited? Besides tying a program-best 12 wins in a season, the victory also marked the 102nd of his coaching career at Mizzou, which also is a school record. But Pinkel and the Tigers didn’t have an easy road to dance fever. First, it took a backup QB to get them going in the second quarter, as redshirt freshman Maty Mauk momentarily replaced a struggling James Franklin under center. Mauk used back-to-back 35- and 34-yard rushes to set up a 24-yard TD pass to senior WR Marcus Lucas, breaking a 7-7 tie. For the most part, the offenses were running on fumes until the fourth quarter, when the teams combined for 38 points. In the final frame, Josey put the Tigers on his back as he rushed for two TDs to put Mizzou up 34-31. Oklahoma State had one last chance with the ball, but a hungry Tigers defense swarmed senior Cowboys QB Clint Chelf, causing him to fumble. Sophomore DL Shane Ray returned the ball 73 yards to ice the win. Then, the party really got started. Man, do the Tigers really know how to celebrate a win.